If I say the words “rotary hammer,” what do you think? Big, right? Big and burly. Mean. Like twist-your-arm-off mean, I bet. Hell, I wrote about one for PopSci back in 2009 under the title “The Meanest Drill.” As we’ve always discovered here at Toolmonger, though, not everyone has exactly the same needs when it comes to tools. After looking into the needs of electricians and commercial remodelers (among others), Milwaukee thought, “Wow, these people have a lot of our M12 gear, and they could use something capable of dealing with masonry and drilling pretty big holes.” Hence, they’ve created what you see above, which is a hell of a lot smaller than it looks. It’s an M12 rotary hammer, and it’s just 9″ long and weighs just about 4 lbs. It’s a 1/2″ model, and it delivers 0-800 no-load RPM with 0-5,350 BPM hammering. You can turn off the rotational motion for hammer-only to use it as a chipper. Of course, you’re not going to get day-long sessions out of a little M12 battery. 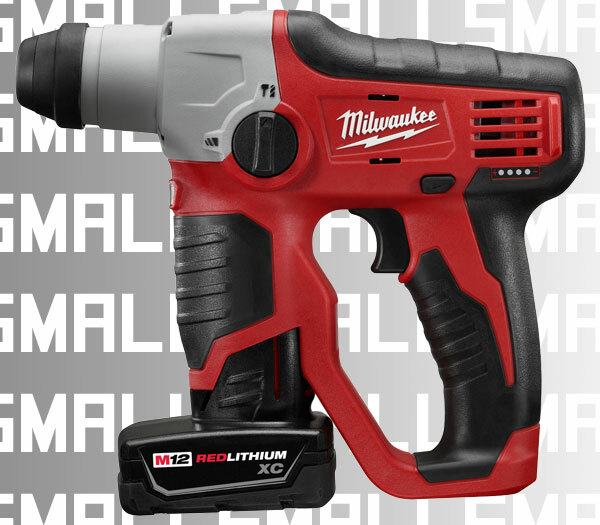 Milwaukee claims about 55 holes per charge, which we’re going to guess are at the model’s 1/2″ rated capacity. It’ll be on shelves later this year in both tool-only and kit form, but we don’t have pricing yet. Well that’s neat. I love my M12 stuff. I’m getting a lot of use out of my little hammer drill that I didn’t expect to. I really expected to use it (in non-hammer mode) mostly for tiny pilot holes in wood while my M18 Hammer Drill would come out for masonry. But the M12 is actually fine for drilling holes for Tapcons. It’s much slower than the M18 but that’s ok if I’m just throwing up a few screws to hang some panels. More than ten or so and the M18 comes out. But that’s a 3/16″ hole. Anything larger than 1/4″ and the tool starts to choke. It just doesn’t have the power in the high rpm mode that you need to make reasonable progress in masonry. I imagine this would have some serious drawbacks. I love my big plug-in rotary hammer. But one of it’s biggest assets is that it’s big and heavy. If the bit grabs the tool jerks a bit and plows on through. The tool doesn’t whip around quite as fast as my M18 hammer drill does. It’s much more controllable (so long as you have a quick-release trigger finger and use good techniques handling it) even when working in mixed material that tends to grab. I can’t see this little guy having nearly as much versatility. It will either be so underpowered that it stalls constantly or it will be hard to control because with it’s short body and light weight it will want to rip itself out of your hands. Still, if all you’re trying to do is drill a bunch of small 3/16″ holes for Tapcons I can see this as a real winner. I’m just very skeptical once you get up above 5/16″. If it’s a reasonable price I may consider picking one up for those days I have to hang a lot of pipe with Tapcons. Would be nice to have something other my M18 hammer drill if for no other reason than bits that won’t slip in the jaws.